Help Identify News Sites for the IIPC Online News Around the World Project! The IIPC’s Content Development Working Group, which is leading an effort to build collaborative, global, web archives on a variety of topics of interest to our members, is kicking off a new project that we are calling “Online News Around the World: A Snapshot in Time” Our goal is to document online news websites during one week of the year from ALL of the countries in the world. archive content from countries and regions not currently being archived by IIPC members. We know we might not reach our lofty goal instantly, and that it will take some time to identify news sites from around the world. We plan to start gradually with a goal of news sites from IIPC member countries, at first. But, here is where you fit in. The Content Development Group needs your help! Please nominate 10 news sites from your country to our nomination tool: http://digital2.library.unt.edu/nomination/iipc-news/. Once we receive nominations, the Content Development Group will review the list to determine what set will be archived. For more information about the project and to find out more about how to help, please contact the Project Team at online-news-project@iipc.simplelists.com or reply to this blog post with your questions! 1 Citation from: Anker Brink Lund: Analysis – An extraordinary ordinary news week. In: Journalisten.dk, 2014-11-14. Is my web archive usable? 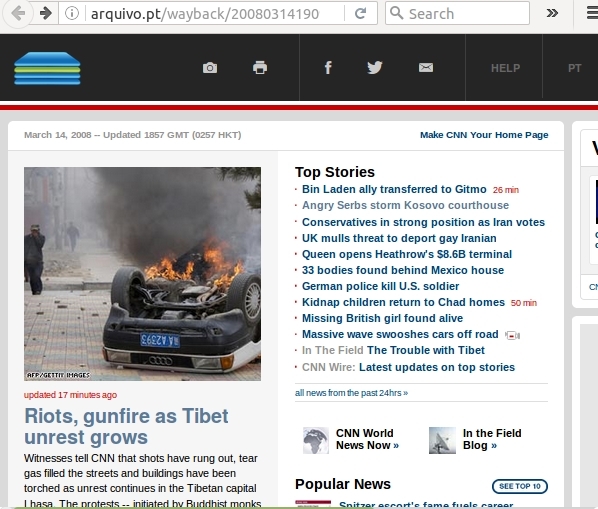 Arquivo.pt has preserved pages from the Web archived since 1996 and provided a public search service to access such information. Fulfilling Arquivo.pt goals relies on the continuous quality assurance of the provided service. 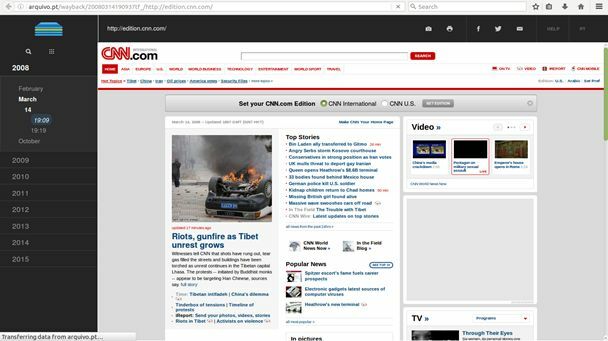 a top banner that enables the users to take full-page screenshots, print and share archived Web pages. We conducted usability testing sessions for quality assurance. The obtained results showed an effectiveness average rate of 91% and satisfaction of 80%. Usability testing showed that the new user interfaces were well-accepted by participants of the test which enabled us to identify and prioritise issues in order to plan future developments. The methodology applied for usability testing was based on the observation and registration of user behaviours while performing designated tasks. A pre-test was first conducted to identify issues with task descriptions. Sessions were conducted by a facilitator and notes registered by an observer. Each session began with an explanation of its purpose by the facilitator who also asked the user to perform the tasks in the most natural way possible while thinking-aloud. The users were asked to perform the tasks using their own favourite device (e.g. tablet, smartphone, laptop). The objective was to maximise the detection of unforeseen compatibility issues and to prevent difficulties stemming from the unfamiliarity with the test device. 2: The user completed the task without any difficulty. At the end of each session, the users were asked to fill an anonymous satisfaction questionnaire. Find in Arquivo.pt the website of the school/university where you studied. Check if there is an archived version of the site when you attended the school/university. Write the date of this version. Write the date of the earliest archived version of the Website of your school/university. Share this version with your former colleagues. Print an archived Web page of your choice to show at home. You were asked to write an article about your old school/ university. 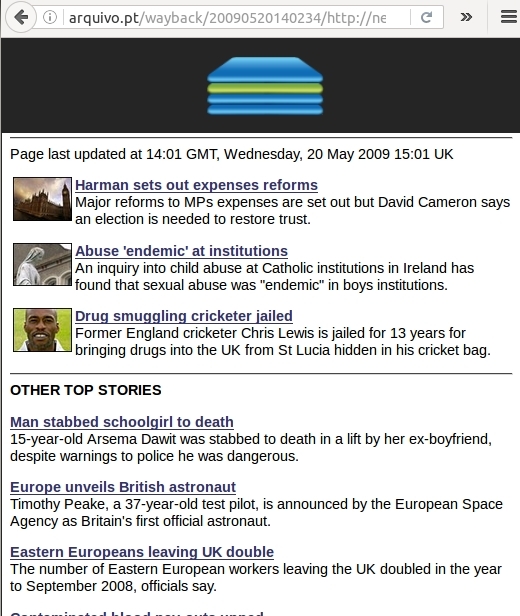 Save the home page of that site as image to be included in your article. Use Arquivo.pt freely and search for something you find interesting. Table 1. Tasks and average effectiveness rate for their completion. Table 2. Results of the Satisfaction Questionnaire. The overall average satisfaction was 80%. The statements to which users most agreed were “The information provided for the system was easy to understand” (86%), and “This system has all the functions and capabilities I expect it to have” (86%). The statement “The organization of information on the system screens was clear” was the one with a lower agreement percentage (69%). the function “Search in other archives”, that links to the Memento Time Travel portal when the users reach a content that was not preserved by Arquivo.pt, needs to be emphasised. Figure 4. Arquivo.pt links to the Memento Time Travel portal when users browse an unavailable content so that they can find it in other web archives. It was very important to allow users to perform the usability tasks with their own devices because it enabled us to test a wider variety of Web Browsers and Operating Systems and detect unforeseen compatibility issues. We identified, for instance, that the new ReplayBar used a CSS element that prevented it from working on any iOS device, which was a major drawback that had remained undetected until usability testing. The definition of broad but realistic tasks for the usability sessions, even if we could not have anticipated the archived pages that the users would access, was fundamental to avoid influencing user answers, observe unexpected behaviours, as well as, understanding user’s expectations and difficulties. Once again, the obtained results showed that usability testing is a mandatory step in the quality assurance of a web archive. Not performing usability testing is an unnecessary risk that jeopardises the success of the significant investments required to build a web archive. Visit us at the Web Archiving Conference 2017 in Lisbon! The OpenWayback project is at a cross roads. The IIPC first took on this project three years ago with the initial objective to make the software easier to install, run and manage. This included cleaning up the code and improving documentation.